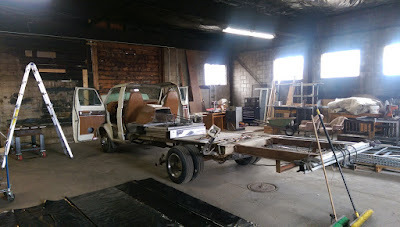 Joule is a new art car being built for the Burning Man 2015 event. 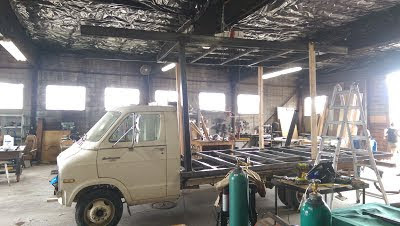 It's being built at the Xanadu shop. 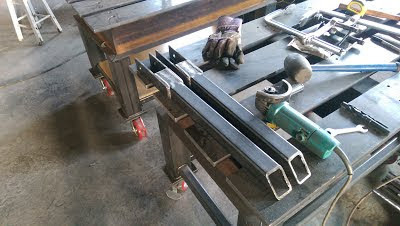 Welded the flat bar to the frame. Naked and Jenn helped weld the c-channel to the base. 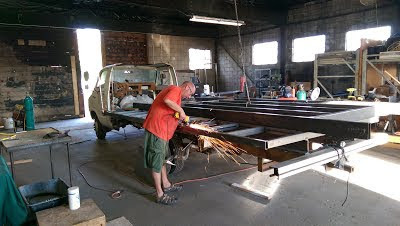 Justin visited from SLC for the weekend and helped welding the lower deck frame. Lots of progress over 4 days. 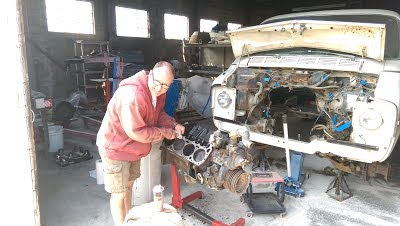 Westy is making progress reassembling the motor. 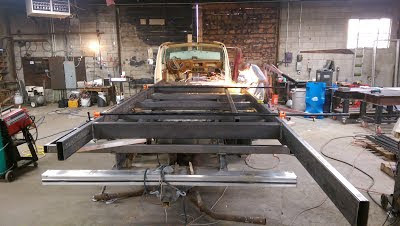 Finished the lower deck including grinding the welds smooth. 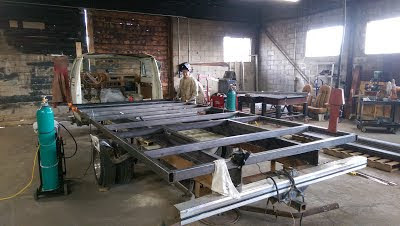 Started on the upper deck, welding on Tuesday and Wednesday evenings with Naked. 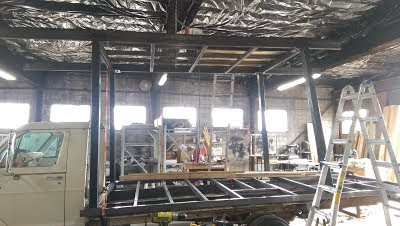 Welded on the upper deck with the help of LeAnn and Jenn. 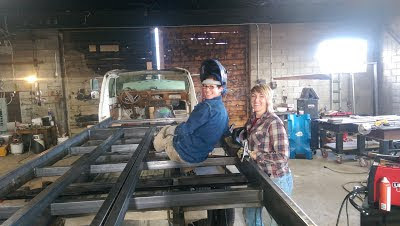 Two lady welders helping at once - awesome! Justin visited from SLC for several days. 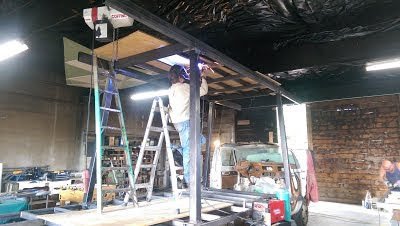 He welded in diagonal supports from where the columns meet the lower deck down to the frame. 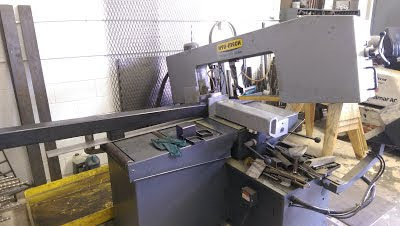 We also used the massive band saw in Dave's shop to cut the vertical support columns. 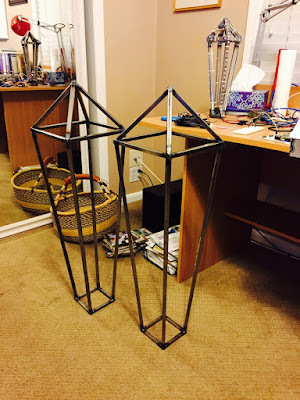 Two angle cuts on two of the pieces! 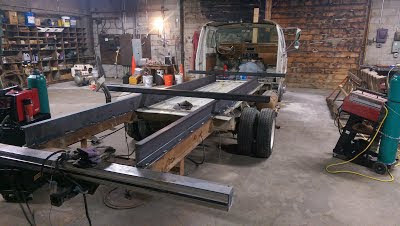 Also marked and started drilling the plates that connect the columns to the upper and lower decks. 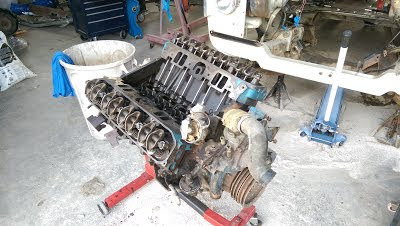 Justin and Westy also got the re-built motor re-mounted. Nice! 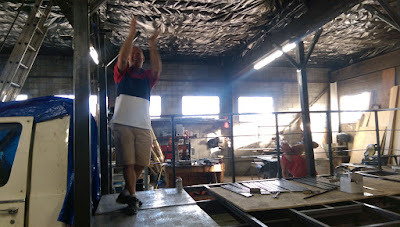 Got help from Taylor, Darrel and Naked testing out the hoist for lifting the upper deck. 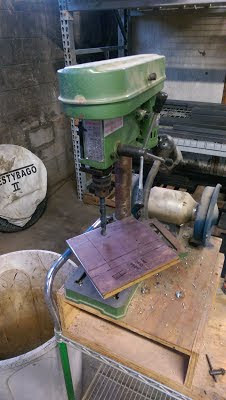 Also made progress on drilling screw holes in some brackets. 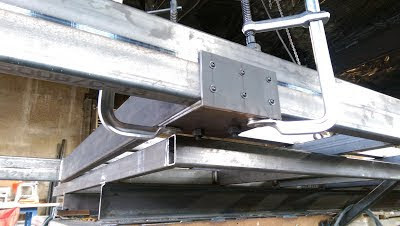 Spent Memorial Day working on brackets that attach the columns to the upper deck. 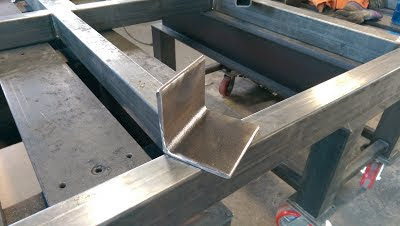 Also started welding on some brackets. Learned to tap screw holes. 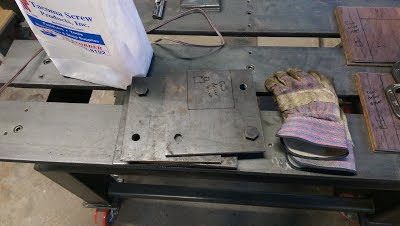 John Hergenrather dropped by for a couple hours and helped drill the large holes in the brackets. Thanks John! 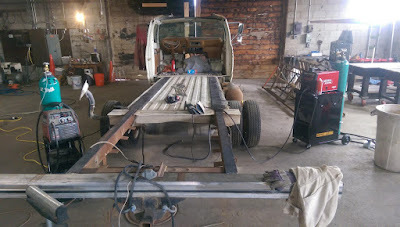 Naked and I worked on tapping holes and welding brackets. 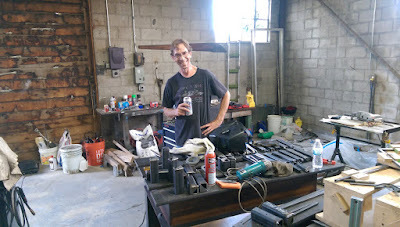 Dirk also dropped by and helped tack weld brackets in the right spots. Lots of welds to grind too. Big day! 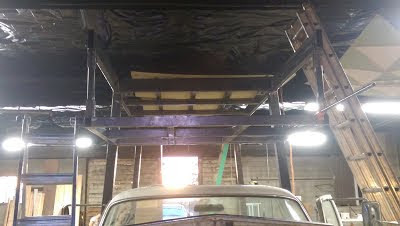 Lifted up the top deck and welded in the columns. 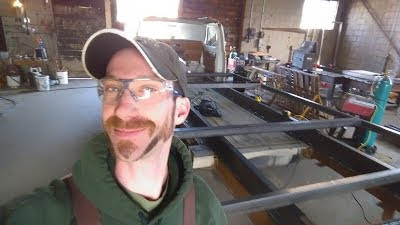 Darrel has become a regular in the shop. 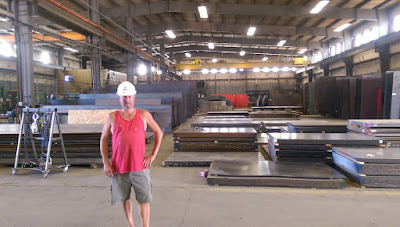 His experience with fabricating metal is a big help. 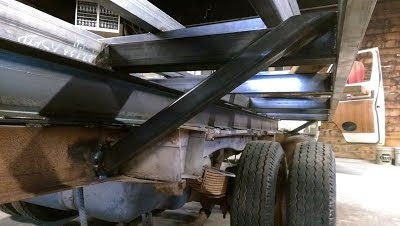 Worked on the "nest" and welding all the 'underneath' metal seams. Lots accomplished over a few days. 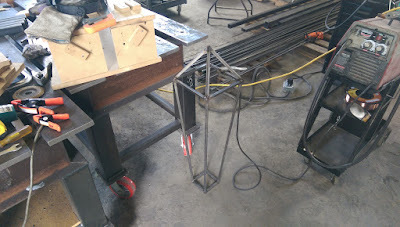 Finished the nest and hanger brackets. Hung the nest and bolted it in place. 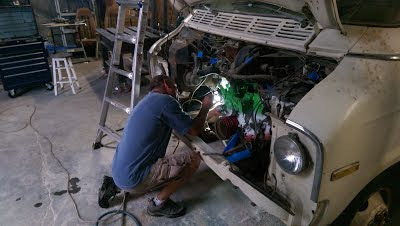 Westy is back working on the motor. 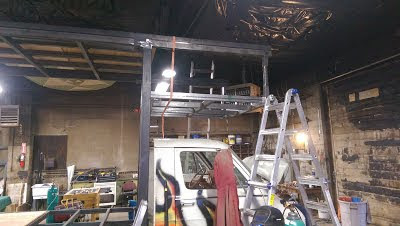 Built the DJ stand bumpout for the top deck and welded it in place. 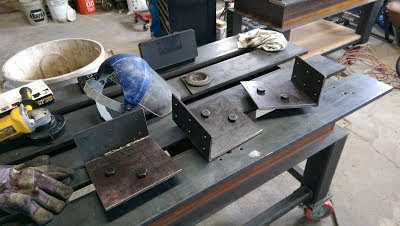 Finished the first two brackets to gusset the upper deck. 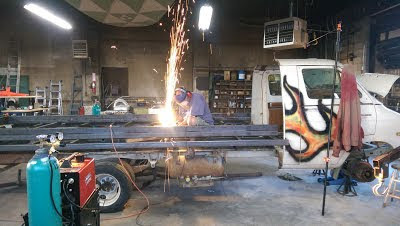 Darrel and Naked helped weld up all the upper deck braces. Also built Alpha gem #2. Spent the weekend adding railings to the lower deck. Also cut lots of pieces for the 24 Alpha gems. 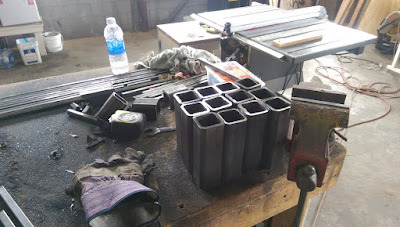 Cut pieces for the upper deck railing holders. 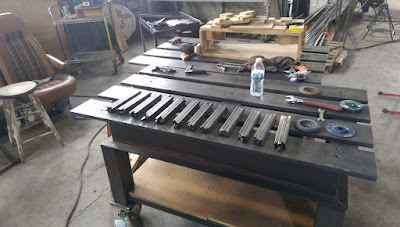 Prep work on the upper deck railing holders. 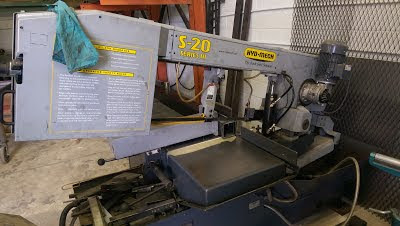 Cutting more gem steel and grinding it. 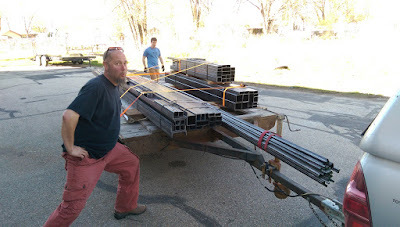 Picked up railing steel from Pacific Steel in Nampa. Union fun! Justin visited from SLC. 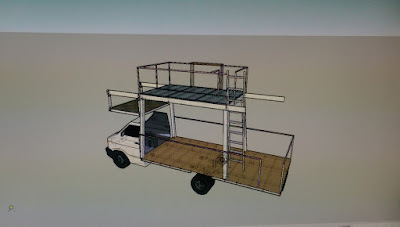 Spent Monday morning plotting out lighting, power supplies, generator capacity and Beagle Bone requirements. 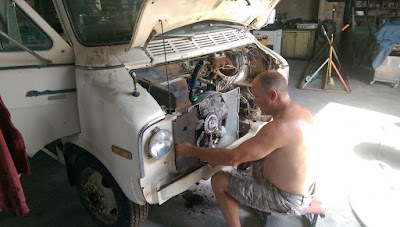 Westy got the motor installed and fired it up. Dancing ensued on Tuesday. 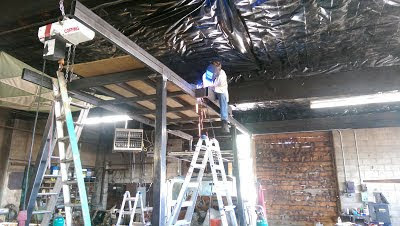 Darrel had a great idea to make welding the upper deck easier. 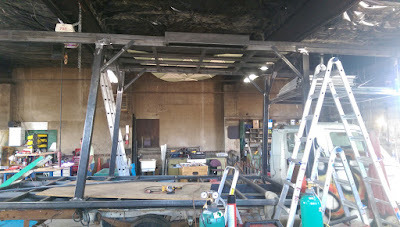 We unbolted it and used the hoist to lower it down onto a welding table. Much easier to work at floor level! 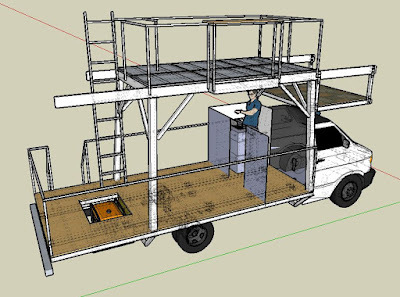 Darrel and Naked welded on the removable lower deck railing, upper deck railing holders and gems. 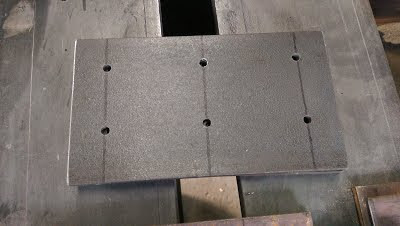 Taylor helped grinding welds. I cleaned and sprayed primer on the lower deck where boards will be inserted to seal the inner area below the lower deck. 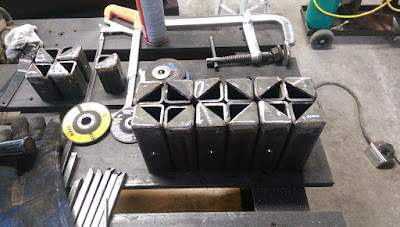 Welded up some gem tops. 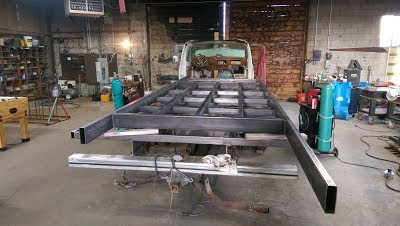 Finished welding and grinding the lower deck removable railing. Drilled holes for pins. Finished cutting railing uprights for the upper deck. More gems tacked together by Naked. 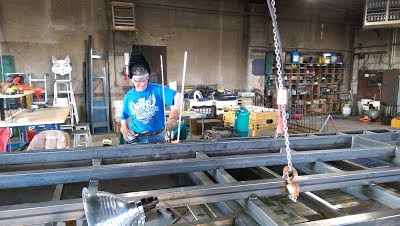 Darrel started on the upper deck railings. LeAnn dropped by to weld on some gems. Met Richard in Seattle. Here's the scent cannon we'll be putting on the car. Custom smells for Joule! Prepped the rear bumper for tail lights and towing plug. Painted the lower deck and columns with rusty metal primer. Modified the gas tank filler to attach to the lower decking. Prepped the generator box area. LEDs and power supplies arrived from China. Painted the rear bumper with the aluminum color paint. Looks good! Taylor and Naked welded and ground gems. Naked worked on the tail light wiring. 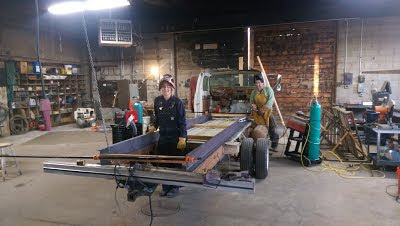 Shannon and Summer helped cleaning the upper deck metal and the shop. 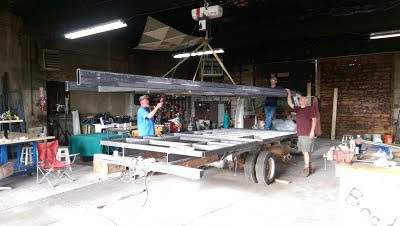 Fat Tony started sealing the lower deck wiring space and prepping the lower deck flooring for installation. Reiley learned to weld and helped fill welds on the gems. Finished drilling and tapping the railings on the upper deck. 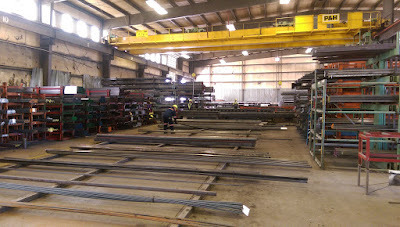 Lots of help welding and grinding the alpha gems. 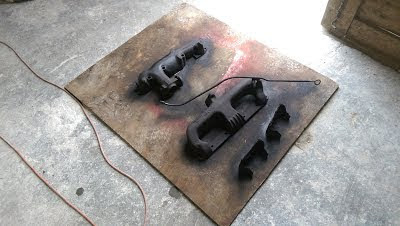 Painted the upper deck with rusty metal primer. 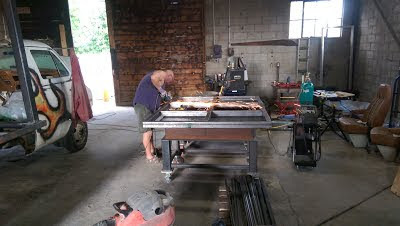 Justin and Martha are back in town and helping in the shop now. Alpha gems also started getting the primer base coat. Finished the generator box. Drew started on flooring on the main deck. Painted the upper deck and support columns with the aluminum color top coat. Nice! 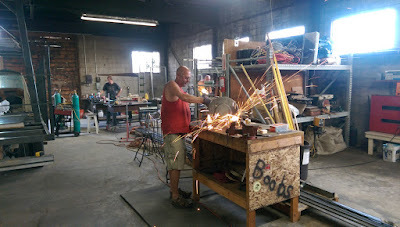 Justin built jigs for making the beta gems. 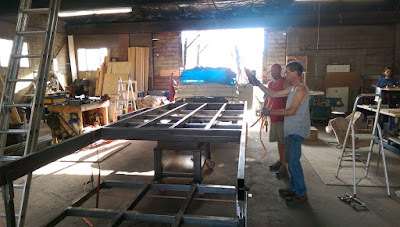 Big day Saturday reattaching the painted upper deck to the support columns. 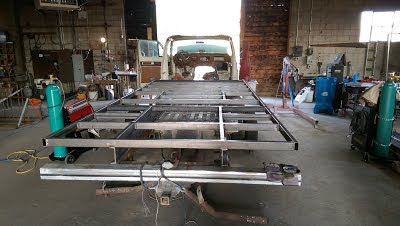 Joule is really starting to take shape now. Finished the lower deck flooring and access hatches. Go Fat Tony! Painted the cab aluminum. So shiny! Tested subwoofer placement and planned out the control room. Painted all the upper deck railings with primer and paint. 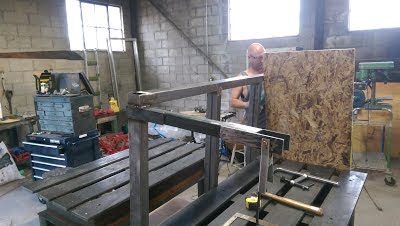 Naked and Phyxx started custom fitting the wood for the control room. Justin got some beta gems welded up. Alpha gems got painted cobalt blue metallic. They look awesome. 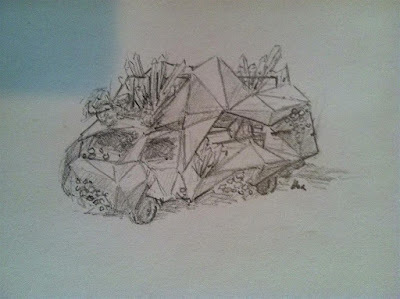 Started planning out some gem cluster arrangements. Huge work weekend. So many volunteers making progress. Darrel stopped by one last time before moving to show off his new electric bike. Sweet! 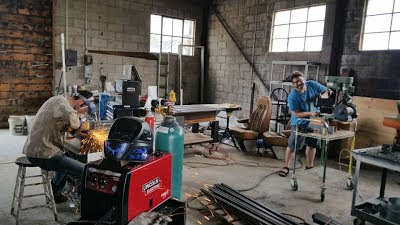 Daniel helped all day grinding gems that Andria and Kaden were filling welds on. All the speakers and drive rack arrived, so Justin, David and Grant got it all hooked together including a borrowed mixer from David. Control room got nearly completed. Started on the electrical including wiring in the breaker panel and some plugs. John H. sealed up the roof of the control room. Naked built benches for the nest. 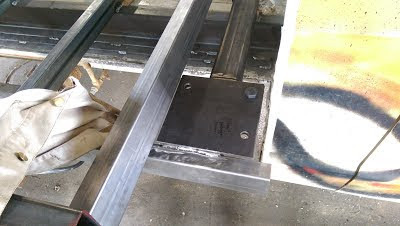 Phyxx worked on a dutch door for the control room. 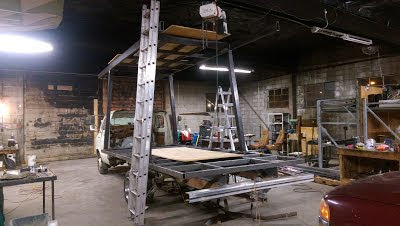 Justin and I designed the rear stairs, and I built those and got them primed. Wood steps need to be added. 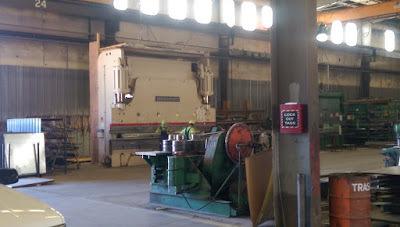 Before leaving the shop Sunday we turned up the sound system and measured 109dB at 15 feet. It sounded good. And that only took 4 amps. That helps the power budget a lot. Justin built the first gem cluster. Looks awesome. Phyxx built Dutch doors on the control room. Naked finished up the control room. 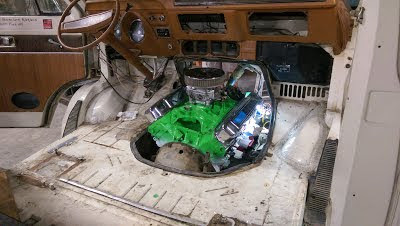 I made more progress on the AC electrical system wiring. 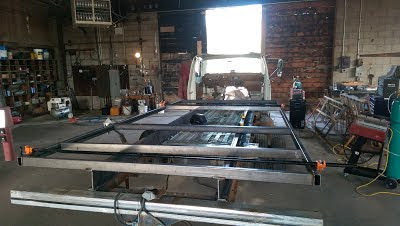 Naked did some sweet looking metal work to mold the cab back to the control room. Ray started painting the cab using some negative image method to create gems. I love it! Lots of volunteers getting small projects done. 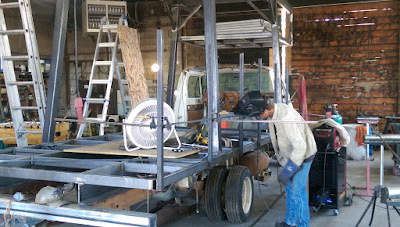 The crew is working every day, pushing to finish by 8/25 when Joule leaves for the playa. Eric helped finish up the scent cannon piping. Kaden and Shannon zip tied all the gem clusters together on the railings. 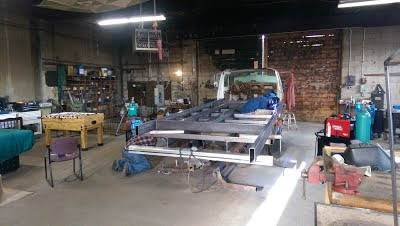 Justin and I were tack welding them in place, then taking them down to do finish welding and attach hanger brackets. Then off to painting in prep for attaching LEDs. Ray kept up on painting the entire control room. Is that an Opalessence and Marvin I see? Grant started helping with soldering. 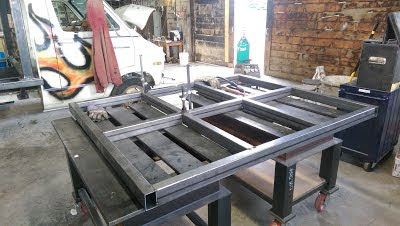 Jeremiah helped build extension feet for the stabilizer jacks. Kaden, Jeremiah and Justin started attaching LED strings to the gems. Progress! Crunch time! Soldering was in progress to bridge cuts in the LED strings. The equipment rack got loaded in the control room and secured by Naked. Naked also carpeted the interior of the cab. Martha, Connie and Ryan helped make the power supply boxes. Phyxx finished the wood shelves under the deck for the power supply and computer boxes. Martha and Kaden did finishing work on the gem clusters with zip ties and shrinking the heat shrink tubing. 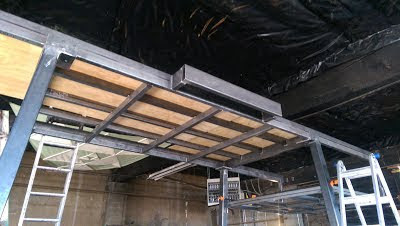 Justin made a gutter system for the wiring to run under the deck. John and Jeremiah helped on many miscellaneous projects. So then this happened. Champagne toast and christening party Saturday evening. Good times! Final two days of work. Many people helped including Reiley, Grant, Calvin, Dirk, John and Tom. Nice that John's employer let him volunteer during work hours to help out! All the power cables and data cables (about 120 in total) got measured, cut, connectors attached, and heat shrunk. Main speaker mounts got attached by Justin and I. Supplies got boxed, and everything was packed for transport. Joule is headed to the playa!